First of all, Costa Rica is HUGE. Anyone of your friends, family or contacts that have been there know while it's still a developing country, this country is about to take off in the tourism industry. With good reason, too. And it's a hugely exciting time to want to travel there, so let this blog post serve as a mini-guide (to our VRX trip) but also for anyone who's thinking about going to Costa Rica. Tons of money, infrastructure and development projects are going on in Costa Rica right now (seriously - you should see the number of retirement homes for foreigners here), and it's all because of Costa Rica's wildlife preserves, fresh fruit, incredible food, perfect year round weather, light friendly atmosphere and way more. I'll do my best to cover some of the highlights I know of - as well as pieces of our itinerary, but feel free to comment down below with anything I missed! Again, back to the whole Costa Rica is huge part, there's only one major airport - and that's in the middle of the country, ironically. 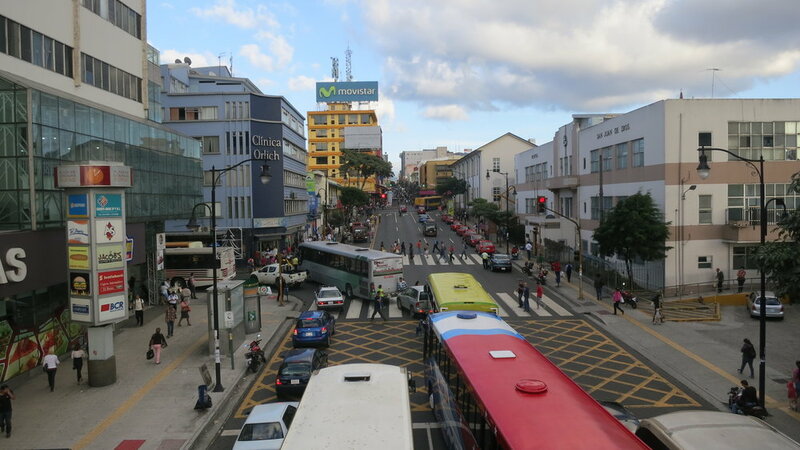 And before we get into why Costa Rica is AWESOME, let's talk about San Jose, which seems to be country's only quagmire. This is San Jose in a nutshell. Big city, lots of things to do, try, but Costa Rica is much better outside the central city! San Jose, in and of itself is not a tourist destination. It's a conjunction of everyone on the outskirts of the country meeting up in the middle of the country to do commerce. It's not very walkable, navigable, or really that friendly. It's kind of a dump - and even worse, there's literally no street names, designated addresses or even marked highways and routes. It's seriously a mess. That being said, you don't have a choice to fly in anywhere else (if you're coming from the US) so make the most of it and try to see the beauty of San Jose for the limited time you'll probably spend here. Anyways, for our trip, let's talk about why Costa Rica rocks. Whitewater rafting in the mountains of Costa Rica? Yeah, we're in. For our VRX trip, you'll fly into San Jose and will head to Alajuela backpackers for the evening and will get picked up in the morning to get whisked away to go whitewater rafting. Awesome, right? After the first few hours in the morning, you'll have lunch on the river, before heading down the rest of the river. The mountains are about a two hour drive from San Jose (till the start of rafting) and then about another two hours of driving after you finish, until you get to Puerto Viejo and The Cashew Hill Jungle Lodge - our main stay for the rest of the week. Our main stay will be at the Cashew Hill Jungle Lodge in Puerto Viejo. Now, the Cashew Hill Jungle Lodge is situated on the hill overlooking the Caribbean Sea. It is known for its vegan-friendly cafe, as well as sunrise and sunset yoga. Being one of the premiere destinations in Puerto Viejo, these jungle lodges will make you feel right at home during your weeklong stay in Costa Rica. Now, since Puerto Viejo is on the Caribbean side of the country, the surf is a little bit lighter and the sunrises are absolutely incredible. Like, seriously, out of this world. One of the best things about Cashew Hill Jungle Lodge is they offer yoga classes throughout the day. If you're into CrossFit, our company will do beach WOD's in the middle of the morning, but you should still take the time to stretch and reconnect with yourself and partake in some yoga at sunrise, or sunset. Cashew Hill also boasts an incredible vegan cafe (don't worry there is protein in there too) and you'll have access to cooks for breakfast and lunch everyday on the trip. You'll be able to reconnect, feast on fresh food and be steps away from the beach. Not bad, eh? The rocky coastline and sultry sand make for the perfect adventurous beach day. Everyone knows Costa Rica is primarily made up of rainforests, but with that are some SERIOUSLY untouched beaches. And with those beaches come the crystal clear blue waters of Costa Rica. The Caribbean Sea is warm (especially in Costa Rica) and anyone going will surely have to take multiple days to just sit outside all day and soak in the sun. That being said, after morning YOGA, we'll offer some beach WOD's and runs during our stat at Cashew Hill. Puerto Viejo gets HOT during the day, so the earlier we get those workouts in, the better. Plan to bring your shoes for a few beach runs, burpees in the sand, jumping jacks and more. Coach Larry and Ashley have plenty of travel WOD's in store for you, so don't hold back. The point will be to sweat! Cashew Hill does have laundry options too, so don't worry about overpacking. You'll be able to reuse your apparel throughout the week. A complete list of travel workouts you can do anywhere. From hotel gyms, to the great outdoors. Take your fitness with you wherever you go. The beaches in Costa Rica are INSANE. We will also include a free two hour surf lesson from a local in Puerto Viejo! Now, talking about those beach days...Costa Rica really does have some of the nicest, most pristine beaches you've ever seen - and you're going to want to bring sunscreen. Being that much closer to the equator, you're surely going to feel the sun beat down on your back, and you're better off protecting yourself, rather than trying to hide from it all week. With that said, we're going to be in and out of the water all week. The Caribbean Sea is incredibly warm year-round, and our time at the beach will be a mostly relaxing one, with kayaks, snorkeling gear, paddle boards and more to rent and play on for most of the day. Like we mentioned above, the Cashew Hill Jungle Lodge is just a few minutes from the beach, as well as the town of Puerto Viejo which houses tons of other travelers, shops, restaurants bars and so much more. During our stay here throughout the week, Taco Tuesday's as they're known in Puerto Viejo is the biggest night of the week to go out and drink, so we will organize a group dinner and pub crawl that night. Puerto Viejo has some really nice, fun bars to go out and enjoy yourself. Not to mention, they have some amazing music as well. In culmination, the rest of the days we'll have more time at the beach, yoga sessions, waterfall hikes, restaurant-hopping and more. You are welcome to rent a car, visit the orange grove farms, banana farms or more. This entire trip is pretty loosely planned with recurring activities, but we've structured if that way because we know the warm weather gets to people and we want to give YOU the options to do what you want in Costa Rica. If you want to rent a car, you are more than welcome to, but Puerto Viejo has surrounding waterfall hikes, rainforest excursions and more, so Wednesday, Thursday and Friday we'll run optional tours to this and the wildlife sanctuary in Puerto Viejo, where we will buy your tickets etc. Multiple yoga sessions a day are included in the price. Enjoy the life, soak in the sun, breathe the fresh warm air and stretch out your soul on our Costa Rica trip. There is a million things to do - and whatever you choose is the right answer. The most important thing you can do on vacation is RELAX! Lastly, while Costa Rica is an up and coming country, you do need to be safe and be prepared for any potential situations. Much like any country, bad things do happen - and you should always have eyes, ears and buddies around you to prevent any sort of trouble. Staying out extra late isn't advised, nor is traveling anywhere by yourself. It can be rather obvious when you're an American and be by yourself. Be smart! Be proactive and stick with the group, or some buddies you trust. The Cashew Hill Jungle Lodge is more than adequate at providing the necessary security, safety and well-being of everyone who stays there. Trust me, you'll feel right at home here in Puerto Viejo - and whether you come on our VRX trip or not, your trip will be well worth it to Costa Rica! Traveling to the Manuel Antonio side? Check out our friends at Under30Experiences and see what they have to offer on the Pacific side of Costa Rica! They run trips there quite frequently and we're big fans of their eco-tourism. Click the image down below to see our full trip page with more details on on our tour.